UPDATE 8/8/2017: A new image of the Orange County Government Center surfaced on Twitter and sparked quite a discussion. That tweet has been embedded below; the original article begins after the break. Since early 2016, when images surfaced showing the skeletal condition of Paul Rudolph’s Orange County Government Center, construction has continued at a fast pace in the Village of Goshen, New York to renovate and expand the iconic Brutalist building. New pictures reveal the scope and scale of the renovations. This saga began in 2011 when the municipal occupants vacated the complex citing damages from Hurricane Irene and began the process of planning its remodeling. After Boston-based designLAB withdrew its proposal because of ethical concerns over the project’s scope, Rochester, New York–based Clark Patterson Lee took on the renovations. Against the almost united outcry of architects and preservationists, the county government ultimately decided to demolish roughly one-third of the complex and replace it with a new architectural appendage. The new wing cuts off access to the central courtyard from the outermost corners of the site and leveled much of the exterior site design, dramatically changing the building's relationship to the ground. Additionally, the corrugated concrete blocks from the facade were stripped from the reinforced concrete frame and replaced only after the interior walls and windows were gutted. 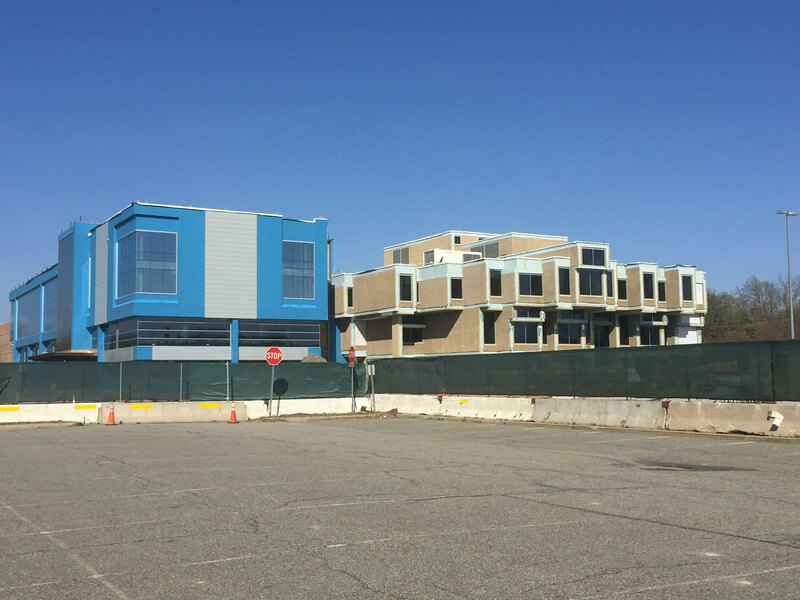 The video below, from early April, shows construction in progress: In a meeting with the Orange County Building Committee in March of this year, Clark Patterson Lee presented a full set of floor plans. They show an extensive revision of the interior organization of space, favoring conventional double loaded hallways instead of Rudolph's more organic layout. The plans also indicate a subdued sectional profile that eliminates many of the dynamic elevational changes found in Rudolph's seminal sectional perspective drawing of the building. County officials were not immediately available for comment regarding their motivations for the interior refiguring or decision to demolish part of the historic structure. However, a recent report from The Warwick Advertiser does cite a county official who stated that the project would be done “on time and on budget.” For others though, discontent with the project persists. Liz Waytkus, executive director of Docomomo US, a nonprofit dedicated to the preservation of modern architecture, recently visited the site, calling the renovations a “cultural crime.” She also highlighted the precarious future for Rudolph's other buildings around the country, including Government Civic Center in Boston. As construction comes to an end, loyal disciples of the Brutalist style may elegize the Orange County Government Center such as Rudolph designed it; however, architects may yet find value in the final building as a cautionary case study for how to strategize future preservation efforts. Concrete architecture from the 1970s hasn't been faring well of late, but while Bertrand Goldberg's expressionist Prentice Hospital seems destined for the wrecking ball, Paul Rudolph's Orange County Government Center in Goshen, New York has been spared. In a 15-6 vote, the members of the Orange County Legislature backed a resolution to renovate the building, defeating efforts by County Executive Edward Diana who has pushed for demolition of Rudolph's dynamic and puzzling structure. The arguments hinged on cost more than on architectural merit, but even so, architecture fans will be relieved that this unique building will be spared. In yet another turn of the screw, Orange County, New York county executive Eddie Diana's claim that a FEMA report proved Paul Rudolph's Government Center sustained substantial damage from Hurricane Irene turns out to bogus at best. Dogged reporting from the Times Herald-Record reveals once again that the county executive's numbers just don't add up: "Diana told reporters that county officials have coaxed FEMA into raising its original estimate to $535,000 from $505,000. By contrast, the county’s consultants had estimated $10.5 million in damages." FEMA officials blame the bulk of the damage on poor maintenance. 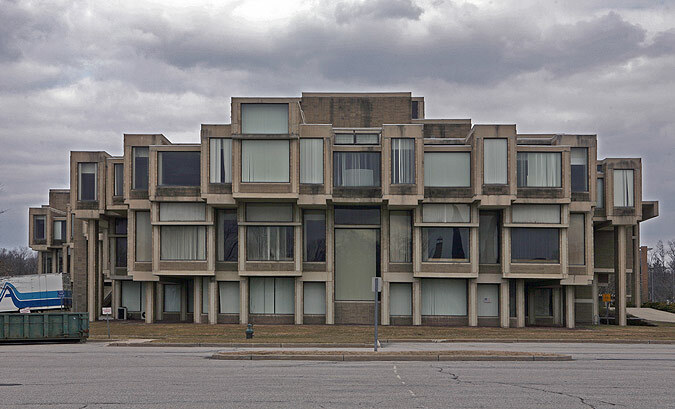 The perplexing yet bewitching jumble of concrete boxes known as Paul Rudolph's Orange County Government Center in Goshen, New York has been granted a reprieve. The county legislature voted 11 to 10 against a bond issue which would have funded the demolition of the Paul Rudolph designed building. Preservationists and architects have been following the project closely, and have made compelling arguments against the demolition and in favor of renovation. No word yet on whether the county will move to renovate the building, which suffers from leaks as well as damage from tropical storm Irene. Recently AN put a spotlight on Rudolph's threatened Orange County Government Center, through photos and reporting, and many others are coming to defense of this challenging and bewitching building. The World Monuments Fund declared the building a culturally significant site, and a local group is protesting the planned demolition. Bloomberg's James S. Russell just visited, declaring it, "insistently attention-grabbing in photos, the building reveals a surprising delicacy in person. Rudolph’s complicated shape-making domesticates the building’s institutional scale." Will prominent architects from around the country rally to around Rudolph's singular creation? Time is running out. [This photo essay accompanies AN's recent article on the pending demise of Paul Rudolph's Orange County Government Center in New York. Read more here.] 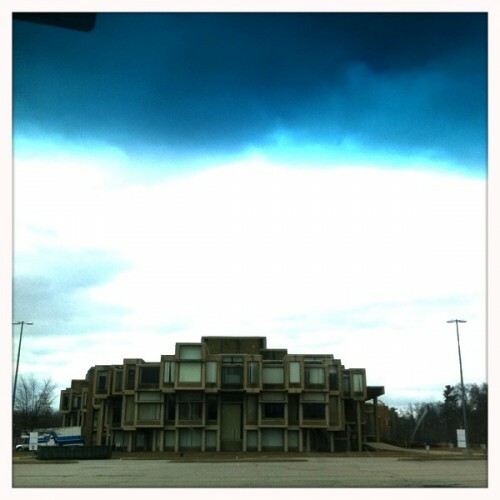 The day before Orange County Executive Director Eddie Diana presented plans for replacing architect Paul Rudolph's Orange County Government Center, AN took a trip up to Goshen, New York with photographer Aracelis Diamantis to check out the scene. Diamantis ditched her SLR in favor of a Hipstimatic app on her iPhone. The effect gave the building a haunted-Brutalist-house quality and amplified the the architect's multi-textured use of concrete. Click on a thumbnail to launch the slideshow.